For my first blog entry, I wanted something friendly and optimistic. I remember the "Great Big Beautiful Tomorrow" song from a trip to Walt Disney World's Carousel of Progress when I was eight. How far back was that? Pretty far. While visiting Disney World, I visited Tomorrowland. I rode on simulated flight to Mars and an exhibit about flight sponsored by Eastern Airlines. Tomorrowland was closer to a world's fair than a theme park. It was meant to be fun for excited kids and their stressed out parents, yet there were some educational and inspirational moments mixed in with the corporate marketing. On that same trip to Florida I went to Kennedy Space Center and walked inside the giant vehicle assembly building, where Saturn V rockets were assembled for moon flights. I stood in awe at the rocket garden outside the visitor's complex. When you are eight years old and see real space hardware up close for the first time, it leaves an impression. The transition from the kiddie ride world of Disney to space age reality can shake you the same way shuttle liftoff does an astronaut. To the child that I was, it was the first awareness that I would see the world change so quickly and radically in the small space of time that is a human life. Humans would make further steps in reaching for the stars and creating a more harmonous world. During this time in my life, I was also becoming aware of disasters and horrors brought by technology. I would soon become all too aware of the threat of nuclear war, fought with missles not unlike those in the rocket garden. It was just a family vaction that summer, but much of what I saw would echo through my later life. When the year 2001 dawned, there were no spinning wheel space stations or bases on Mars. I had discarded any hope that the future would be a Disney-esque wonderland before I left elementary school. But the magic four digit year had arrived. I found myself using technology everyday that would have sent my eight year old self into spastic a fit of yelling "COOL!" Now in 2006, the events of the last five years have made me feel a Space Mountain ride of highs and lows. I am both jaded and giddy. The September 11th attacks, the destruction of the space shuttle Columbia and the flooding of New Orleans make our present seem borrowed from the pages of dystopian science fiction novels. 2001 through 2005 owe more to J.G. Ballard and George Orwell than Arthur C. Clarke and Ray Bradbury. But we have also witnessed the first private space flight roar into the skies over the California desert. Private citizens have been creating and communicating with new tools and outlets for information. An entire music collection, a library of text, and even hours of video can be carried around in a device the size of a deck of playing cards. In 2006, we may be afraid of terrorists, annoyed by phisher emails, and chased by our work-lives in our private time thanks to cell phones and pagers, but every so often there are amazing events that are worth noticing though the clutter of info-tainment and marketing. That is my hope for this blog. This is my space to sort through what amazes me and what scares me about our present and future. This is my Tomorrowland where I get to design the rides. As a world weary adult, I sometimes snicker at the future saw visiting Disney World back then. 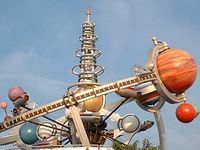 Tomorrowland has been redesigned since then. The Mars flight simulator has been retired and the buildings now reflect a retro-future look. It is more Buzz Lightyear than Neil Armstrong now. I fear sometimes that reflects what we feel today about dreams of the future. That we have become so bored by science and technology that nothing amazes us anymore. But every so often, something does cut through the static and glare of our media-saturated world. Two yeas ago on January 3 2004, the martian rovers, Spirit and Opportunity, landed on the planet Mars. They left Earth from launch pads I gazed upon as a child from the windows of a tour bus. Two years after they plunged through the thin Martian atmosphere they are still functioning, weathering the cold and dust of a distant planet. They journey on and send us pictures and data. It is something that would have made an eight year old boy yell "COOL!". It is the year 2006. May it be a bright beautiful tomorrow.